~ This blog is about Search Engine Friendly Website guide and reviews of latest internet marketing trends. Which one? Panda or Penguin? Panda penalized websites for low quality content and with poor links. 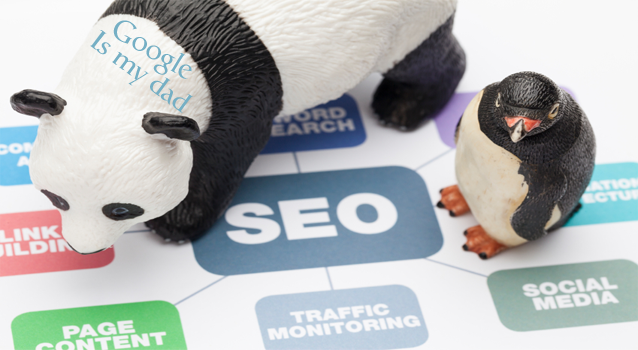 Whereas the new Panda update would penalize websites if they do not follow the Google Webmaster Guidelines. Both penalize by reducing the search engine result ranking of the page. Panda is an older algorithmic equation revealed in February 2011, whereas the Penguin update was revealed in April 2012. The Penguin update is quite better in functioning as compared to the Panda update. This can be proven by the fact that Penguin has received just 3 updates since its manufacturing whereas the Panda had received 24 updates till the arrival of the Penguin. Panda was a basically web page based algorithm that only looked for faulty content or copied content over the internet. Whereas Penguin checks a lot more than just content but rather the backlinks, the faulty advertisements as well as the Backlinks of the websites. Penguin does an analysis ten times better than that of Panda. The difference between Google Panda and Penguin Update must be made clear by now. There are certain Panda and Penguin Recovery guides that need to be followed if you want to avoid any hunting down by these algorithms. If so, then your web page will remain safe.